Intrauterine infection is considered as one of the major maternal insults during pregnancy. Intrauterine infection during pregnancy could lead to brain damage of the developmental fetus and offspring. Effects on the fetal, newborn, and adult central nervous system (CNS) may include signs of neurological problems, developmental abnormalities and delays, and intellectual deficits. However, the mechanisms or pathophysiology that leads to permanent brain damage during development are complex and not fully understood. This damage may affect morphogenic and behavioral phenotypes of the developed offspring, and that mice brain damage could be mediated through a final common pathway, which includes over-stimulation of excitatory amino acid receptor, over-production of vascularization/angiogenesis, pro-inflammatory cytokines, neurotrophic factors and apoptotic-inducing factors. Several maternal insults during pregnancy are known as major cause of fetal brain damage, including infection [1–3]. Maternal insult was associated with morbidity and mortality to infants, increased risk of intraventricular hemorrhage, neonatal white matter damage, and subsequent cerebral palsy. The susceptibility of the immature CNS to maternal insult is largely dependent on the temporal and regional status of critical developmental processes, as well as on the regulation of cerebral blood flow and metabolism. It was suggested that brain damage of offspring, which belong to mothers who have suffered of intrauterine infection/inflammation during pregnancy, is mediated by neurotoxicity (2–4). The mechanisms or pathophysiology of fetal neurotoxicity, induced by insult exposure are complex and not fully understood. It is possible that intrauterine infection/inflammation is mediated by factors that affect a final common pathway leading to neuronal injury, such as initiation of apoptosis, cellular dysfunction and death [1, 2]. Clinical chorioamnionitis is considered as an infection of the uterus and its contents during pregnancy. The incidence varies between 10%–20%. According to histological examination it is affected 20% of term as compared to 60% of the preterm deliveries. It was shown that clinical and histopathological evidence of placental infection were associated with an elevated risk of unexplained cerebral palsy (CP) [odds ratio (OR) 9.3, 95% confidence interval (CI) 2.7, 31 for clinical chorioamnionitis (CA); OR 8.9, 95% CI 1.9, 40 for histology CA]). In addition, the association between chorioamnionitis and cerebral palsy was demonstrated using meta-analysis. Also, an association between CA and both CP [relative risk (RR) 1.9; 95% CI 1.5, 2.5] and cystic periventricular leukomalacia (cPVL) (RR 2.6; 95% CI 1.7, 3.9) was reported (for excellent review see ). It was estimated that up to 12% of spastic CP could be due to intrauterine infection and inflammation . There are specific periods in brain growth during which the developing neurons are particularly susceptible to growth restriction and could be affected by various environmental agents including intrauterine infection during pregnancy. It is suggested that the periods which could be considered as "critical" in brain development is when cells undergo mitosis (the main cells to be discussed are neurons and glia) and also the correct and orderly sequence of cellular migration and the formation of an appropriate histological micro-architecture . Although proliferation and differentiation of astrocytes in rats occurs mainly during postnatal brain development , the presence of radial glia (precursors of astrocytes) were also demonstrated in rat fetal brain at embryonic day 15; from this day the expression of astrocyte-specific protein (GFAP) was demonstrated in glial cells . In addition, the presence of microglia in the fetal rat brain was demonstrated at the embryonic day 17 or 18 . Several studies have shown a link between intrauterine infection and cerebral white matter lesions or cerebral palsy in preterm neonates [11–13]. Inflammatory responses may directly affect the immature brain, in addition to neuronal damage after cerebral ischemia. It was shown that the incidence of immature babies, suffering from periventricular leukomalacia (PVL), was significantly increased after chorioamnionitis [14–16]. In endotoxin-mediated leukoencephalopathy in full-term kittens, the cerebral damage occurred during the postnatal period (2–20 day-old of life)  and in neonatal dogs, of 1–10 days old, with marked inflammatory infiltrates . More recently, it was reported that ascending intrauterine infection with E. Coli caused fetal white matter damage in rabbits; these lesions were observed in 6% of live fetus [19, 20]. Astrocytes and microglia, which are the major glial cells in the CNS, are involved in the regulation of the viability, function and differentiation of progenitor cells under physiological conditions. However, they also mediate cytotoxic effect on oligodendrocytes under pathological conditions, by production of pro-inflammatory cytokines . Glia cells are responsible for the deposition of myelin in the CNS during development . Damage of these cells could result in an inadequate amount of myelin and/or abnormal myelin. Therefore, patients suffering from PVL develop cerebral palsy and impaired cognition during development . It was demonstrated that progenitor oligodendrocytes are more sensitive to cytokine-induced apoptosis than mature oligodendrocytes . Therefore, pathological conditions, such as maternal infection/inflammation may damage progenitor cells or disturb their maturation, and thus affect brain development [2, 4]. Intrauterine infection was suggested to affect the immature brains by leading to cerebral hypoperfusion, which may results in a hypoxic-ischemic brain damage, and/or by inducing the production of pro-inflammatory cytokines such as tumor necrosis factor-alpha (TNF-α), interleukin (IL)-1 and IL-6 from astrocytes and microglia. These cytokines could damage oligodendrocyte progenitors and thus induce PVL . Also, upregulation of archidonic acid metabolism in brain tissue, or activated leukocytes after ischemia may induce the production of oxygen radicals . The effect of these molecules in neuronal cell damage, neurogenesis and neurodifferentiation, in the developing brain has been demonstrated [25, 26]. PVL is a predominant form of brain white matter lesion in preterm infants . It is characterized by small and multifocal regions of necrosis . Astroglia and myelin are important components of the white matter. Inflammation of the CNS is characterized by reactive astrogliosis, typified by astrocyte proliferation or astrocytic hypertrophy . These features are under regulation of pro-inflammatory cytokines . In addition, it was shown that occurrence of PVL is associated with increased number of astrocytes in the white matter lesion of infant brains . 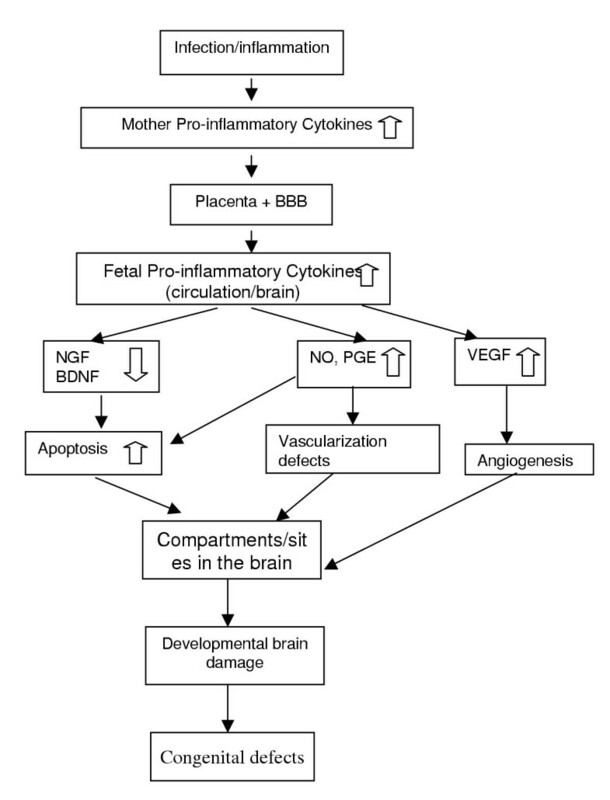 The origin of the high levels of the pro-inflammatory cytokines in the fetal brain could be the maternal uterus and placenta, following intrauterine infection/inflammation, and/or the stimulated fetal brain microglia and astrocytes [15, 31]. It should be emphasized that not all the elevated cytokines in the maternal uterus and placenta are also elevated in the fetal brain. Systemic maternal administration of lipopolysaccharide (LPS) affected the myelination and astrogliosis in the neonatal rat brain . In addition, IL-1, at physiological doses, inhibited normal rat oligodendrocytes [33, 34]. IL-1 stimulates astrocytes growth and increases the appearance of GFAP-reactive astrocytes [34, 35]. These observations may suggest a potential role of cytokines in mediating maternal infection and PVL injury in newborn infants. The expression of IL-1β and TNF-α mRNA was elevated, in the fetal brain, following maternal LPS administration. In addition, the glial fibrillary acidic protein-positive astrocytes levels were increased and the myelin basic protein levels were decreased in the brains of offspring . It was suggested that maternal or placental infection might induce neonatal brain damage by increasing the pro-inflammatory cytokines levels . Recently, higher levels of TNF-α, IL-1 and IL-6 were detected in brains with PVL than in healthy . In addition, it was observed that newborns with brains white matter lesions belonged to mothers with high levels of pro-inflammatory cytokines in the amniotic fluid (AF), however newborns without white matter lesions belonged to mother with normal levels of the examined cytokines . In addition, induced intrauterine infection of rabbits, with bacteria, leads to fetal brain white matter lesions . TNF-α has been shown to increase permeability  and to cross the blood-brain barrier . It also reduces cerebral oxygen uptake, increases intracranial pressure , induces diffuse intravascular coagulopathy, and increases capillary permeability resulting in cerebral edema . TNF-α is considered a potent cytotoxic agent in neuronal tissue . Expression of TNF-α was demonstrated in brains of developing fetuses after an inflammatory stimulation, and in autopsy specimens of children with PVL . TNF-α was shown to decrease the number of oligodendrocyte progenitors, also causing apoptosis of oligodendrocytes [43–45]. Incubation of hippocampal slices, from mature fetal guinea pig, with LPS increased their capacity to secrete TNF-α. It was suggested that the released TNF-α in these slices might induce apoptotic processes in oligodendrocytes and their progenitors [31, 46]. In addition, the combined application of TNF-α and interferon-γ severely reduced survival and inhibited differentiation of oligodendrocyte progenitors in primary culture prepared from neonatal rats, thus may underlie the disrupted myelination that characterizes PVL . Also, higher levels of B-lymphocyte chemoattractant, ciliary neurotrophic factor (CNTF), epidermal growth factors, IL-12, IL-15, monocyte chemoattractant protein-3 and others were demonstrated in sera of children with CP . Neurotrophic factors are a family of proteins, which are involved in the regulation of cell survival and programmed neuronal cell death during development . The capacity of various neurotrophic factors to affect neurons is often developmentally regulated . Some of these factors including brain derived neurotrophic factor (BDNF) and nerve growth factor (NGF) [50, 51] were demonstrated as neuroprotective in experimental models of hypoxia-ischemia. The levels of BDNF were decreased in CA1 neurons of the hippocampus, following hypoxia-ischemia; this was followed by onset of DNA fragmentation and subsequent neuronal death. On the other hand, most of the BDNF-immunopositive neurons did not undergo apoptosis after hypoxia-ischemia . Astrocytes are known to release neurotrophic factors such as platelet-derived growth factor (PDGF), CNTF, BDNF, neurotrophins (NT)-3 and NT-4 [53, 54], all of which have been reported to support proliferation and survival of oligodendrocyte progenitor cells [55, 56]. LPS was shown to disturb the development of these cells, or even to be cytotoxic, by inducing astrocytes or microglia to produce pro-inflammatory factors such as TNF-α, IL-1β, IL-6 and nitric oxide (NO). In addition, LPS could induce cytotoxicity by suppressing the production of neurotrophic factors by astrocytes . The process of angiogenesis drives maturation and elaboration of the primary vascular network via proliferation and migration of endothelial cells . Vascular endothelial growth factor (VEGF), is a polypeptide growth factor, which acts as an endothelial cell survival factor and a vascular permeability factor . In addition, VEGF regulate angiogenesis when acting in combination with other factors such as angiopoietin (Ang)-1 and -2 . Although several growth factors and cytokines influence the expression of VEGF, tissue hypoxia is suggested as the major stimulating factor for the upregulation of VEGF in vivo . Endothelin-1 (ET-1) is one of the most potent vasoconstrictors known . ET-1 is a mitogenic  and anti-apoptotic factor  in many cell types including endothelial cells and astrocytes. Within the CNS, ET-1 was demonstrated in various neuronal groups [64, 65] and in glial cells under pathological conditions . Under ischemia and Alzheimer's disease, ET-like immunoreactivity has been detected in astrocytes [67, 68]. ET-1 was suggested to play a key role in the development of cerebral vasospasm . Proinflammatory cytokines such as IL-1, TNF-α and transforming growth factor-β, which are produced during endotoxemia, are also increased the production of ET-1 from endothelial cells . Thus, it is possible to suggest that ET could be one of the autocrine/paracrine factors in the different brain regions of the fetus that should be considered under intrauterine infection. Nitric oxide (NO) plays an important role in the pathogenesis of neuronal injury during cerebral ischemia. NO is the product of enzymatic activity of the constitutive endothelial NO synthase (eNOS), neuronal (nNOS) and inducible (iNOS) isoforms of this enzyme. After ischemia, NO was associated with cerebral vasodilatation (via inducing eNOS activity), and inhibition of platelet aggregation and leukocyte adhesion (via activation of nNOS in neurons and iNOS in microglia and astrocytes) [70, 71]. During development, the expression of nNOS parallels that of the glutamate receptor and corresponds to regions of selective vulnerability to hypoxia-ischemia [70, 71]. Destruction of neurons containing nNOS in the neonatal rat prior to hypoxia-ischemia lowered the injury score and the frank infraction in the cortex [70, 71]. In addition, neonatal mice with targeted destruction of the nNOS gene were markedly protected from injury to neurons in hippocampus and cortex, when also subjected to hypoxia-ischemia insult. The influx of intracellular calcium is increased during cerebral ischemia, and results in activation of nitric oxide-synthase (NOS) and the production NO. NO, like free iron, can increase the toxicity of superoxide radicals, and thus cause neuronal cell damage [70–72]. Apoptosis in the developed brain (under normal physiological conditions) is believed to occur mostly during prenatal development, decline early post-natally and to be minimal in adult brain [71, 72]. Ischemia and many other acute and chronic neurodegenerative processes trigger apoptosis [70, 71]. Regulation of caspase-3 by BDNF was demonstrated in the neuronal cell bodies and in the striatum and hippocampus following hypoxia-ischemia . Also, upregulation of CD95 (FasL) (the cell surface receptor which induces apoptotic death) was demonstrated in the hippocampus, and thalamus following hypoxia-ischemia injury to the developing rat brain [70, 71, 74]. The neuropeptides alpha-melanocyte-stimulating hormone (α-MSH) is a proopiomelanocortin derivate that show anti-inflammatory effect within the brain. It regulates and mediates the communication between nervous, endocrine and immune system. It is produced by pituitary cells, neurons, keratinocytes and macrophages . The anti-inflammatory activity of a-MSH was demonstrated in different disease including endotoxemia/ischemia [75–77]. The anti-inflammatory activity of α-MSH include suppression of inflammatory cytokine expression such as TNF-α, interferon-γ, IL-1, IL-6 and IL-8, and also the inhibition of inflammatory activity of neutrophils and monocytes [75, 77]. It also blocked LPS-induced expression of TNF-a . In addition, α-MSH was upregulated the anti-inflammatory cytokine IL-10 . Recently, it was demonstrated that α-MSH levels were decreased in plasma of patients with acute brain injury; these levels were in a negative correlation with TNF-α levels . It was also shown that α-MSH acts directly within the brain (through microglia) to modulate local inflammation . Alpha-MSH was demonstrated to inhibit brain tumor necrosis factor-alpha (TNF-alpha), which is involved in human neurodegenerative diseases, induced by local injection of lipopolysaccharide. Ischemia/reperfusion of the brain was shown to induce inflammation in the CNS, and application of α-MSH (systemically) modulated this process. It was demonstrated that such influences of the peptide may occur through inhibition of inflammatory agents produced by glia. Alpha-MSH modulated TNF-alpha and nitric oxide produced by activated murine microglia, and TNF-alpha produced by human astrocytes. Since glial cells can secrete an d react to alpha-MSH, it is suggested that these cells act as autocrine regulatory element, which can regulate both fever and inflammation in the brain [82–84]. Thus, it is possible to suggest that α-MSH could be involved in the regulation of the inflammatory processes in the fetal brains of mothers with intrauterine infection, and to be suggested as a possible treatment of CNS disorders that have an inflammatory component. The involvement of the above factors and mechanisms in the pathophysiology of intrauterine infection during pregnancy and offspring brain damage and development is not yet clear. The association between systemic perinatal infection and cognitive limitations among preterm infants is not yet clear. It has been shown that intrauterine infection and the fetal inflammatory response are associated with an increased risk of preterm birth, which is in turn is associated with poor cognitive and perceptual outcome of the preterm newborn . Therefore, it is suggested that intrauterine infection can impair brain development in a manner that may also affect cognitive ability. Cerebral white matter is most closely associated with long-term neuromotor, cognitive, and behavioral limitations in preterm infants . Nevertheless, some infants exposed to perinatal infection, which do not develop white matter damage, might suffer immaturity-related neuronal damage, neuronal disorganization, and excessive neuronal-programmed cell death, abnormal synaptogenesis, dendritic simplification, and abnormalities in neurotransmitters . In addition, it was shown that exposure of animals to products of infection/inflammation induced cognitive deficits. In Wistar rats, the exposure to pyrogens, including LPS and IL-1β, interrupted task acquisition when administered during the learning process, but not thereafter [85, 86]. Since the biomolecular signals regulated by inflammatory cytokines and leading to behavioral abnormalities are not yet clear, it is suggested that interruption of the proinflammatory cytokine cascade might prevent brain damage and impaired development. The relationship between brain damages of offspring following maternal infection/inflammation during pregnancy is not yet clear. Therefore, some of the suggested therapeutic possibilities are based on possible mechanisms of the offspring brain damages. Since maternal infection/inflammation increases offspring brain cytokines, which may lead to a cascade of events (as described previously), that could injure the offspring's brains, it is possible to suggest anti-inflammatory cytokines and/or specific inhibitors of intracellular event such as free radical synthesis or scavengers, NOS inhibitors and/or scavengers and anti apoptotic agents as possible prevention/therapeutic agents. Possible therapeutic interventions may also include supplementation of trophic factors, which may increase survival and differentiation of oligodendrocyte precursors, as well as anti-inflammatory agents. It should be emphasized that other mechanism such as increased maternal temperature, placental endothelial damage and increased coagulation tendency, fetal hypoxia or acidosis, fetal hypotension and others may also aggravate fetal brain damage. In addition, we did not consider, in this review, the viral infections which also could result in brain damage. In summary, it is possible to hypotheses that intrauterine infection/inflammation during pregnancy may lead to newborn, adult and aged offspring brain damages (Fig. 1). This may affect morphogenic and behavioral phenotypes of the developed offspring. The offspring brain damage could be mediated through up-regulation of pro-inflammatory cytokine production in the circulation and in the brain of the fetal/offspring. These pro-inflammatory cytokines could, by one hand, decrease the production of neurotrophic factors such as NGF and BDNF and, by other hand, to increase the production of NO, VEGF and PGE. These factors increase apoptosis and also may lead to vascularization/angiogenesis defects. Affecting these functions in the brain may lead to compartment/site brain damage, which may, during a developmental window, lead to some neurological diseases and/or cognitive defects. Possible mechanisms involved in the effect of intrauterine infection during pregnancy and offspring brain damage and development.